I re-watched the movie “Live, Die, Repeat: Edge of Tomorrow” last night. It’s kinda like “Groundhog Day” meets “Independence Day,” only better. The basic premise is that Tom Cruise’s character gets killed on the battlefield, but he keeps waking up and repeating the same day. Over the course of repeating the same day (and the same BATTLE) hundreds of times, he becomes almost invincible. He knows what’s going to happen before it happens, and he plans for it. He goes from being a fumbling coward to an absolute beast of a soldier…all because he knows what’s going to happen. And he knows that if he is killed, he’ll simply start the day over. And neither do you, my friend…at least when it comes to mixing. While it would be insane to mix the same song over and over again, you can develop that same kind of all-knowing confidence. Imagine sitting down to mix a song, feeling confident that you can handle anything the mix throws at you. It’s a powerful, almost relaxing place to be. You’ll know what to do, because you’ve done it a thousand times before. And there’s only one way to get there. And if you wanna get there faster, you don’t mix alone. You have a group of people mixing alongside you. And a mentor (or two) who can guide you. 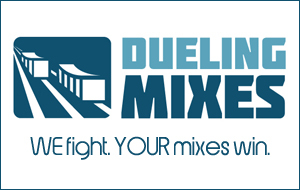 That’s what Dueling Mixes is about. It’s not for the lazy or the cowardly. It’s for the people who seriously want to take their mixing game up a notch.